Stylish and contemporary, this modern pine wood Side Table has classy industrial style perfect for your home. The table is made from salvaged shipping pallets milled into individual tongue and groove planks and features one open shelf that gives it two levels of display. Its wheelbarrow design includes two working sand-cast wheels for an authentic, hand-forged look, and black, powder-coated legs made of solid steel. Perfect beside your sofa or a favorite arm chair, this side table keeps drinks, remotes, magazines, and more within easy reach. 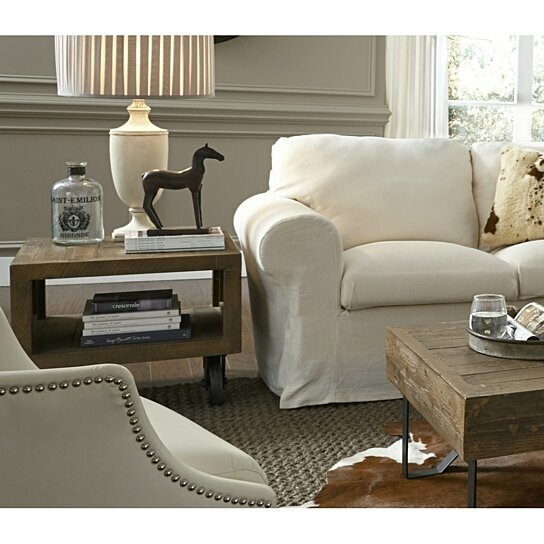 Note: Other featured items in image except this Side Table are sold separately. The wheelbarrow base design of this table features two sand-cast wheels and two legs for an authentic, hand-forged look. The table is made from pine wood with metal base. An open shelf design gives this table two levels of display space.